Feed a Cold, Starve a Cancer? Unlike a fever, starving some cancers is actually a good treatment. And our friend yeast may be able to help. Image from http://maxpixel.freegreatpicture.com. You may have heard the old wives’ tale of feed a cold, starve a fever. Turns out that this isn’t particularly good advice (although some studies do suggest that with a fever, you shouldn’t force-feed yourself). It also turns out to have probably originated in the 19th century and not from Chaucer in the 14th as many websites claim. But while starving a fever is probably never a good idea, starving a cancer can be. Not by following the medical myth that since cancers use a lot of sugar, you can starve them by cutting down on sugar in your diet. Instead you can starve some cancers by denying them the amino acid asparagine (Asn). On their way to becoming cancerous, acute lymphoblastic leukemia (ALL) cells lose their ability to make Asn. This means that unlike the cells around it, they need to pull Asn from the blood to make their proteins and to survive. Doctors exploit this weakness by injecting L-asparaginase amidohydralase (L-ASNase) into patients which starves the cancer cell by depleting Asn levels in the blood. The cells around the cancer cells are fine because they can still make Asn. Right now doctors use L-ASNase from two different bacterial sources: Escherichia coli and Erwinia chrysanthemi. But if a recent study by Costa and coworkers in Scientific Reports holds up, they might want to think about switching to using the Saccharomyces cerevisiae L-ASNase encoded by the ASP1 gene. 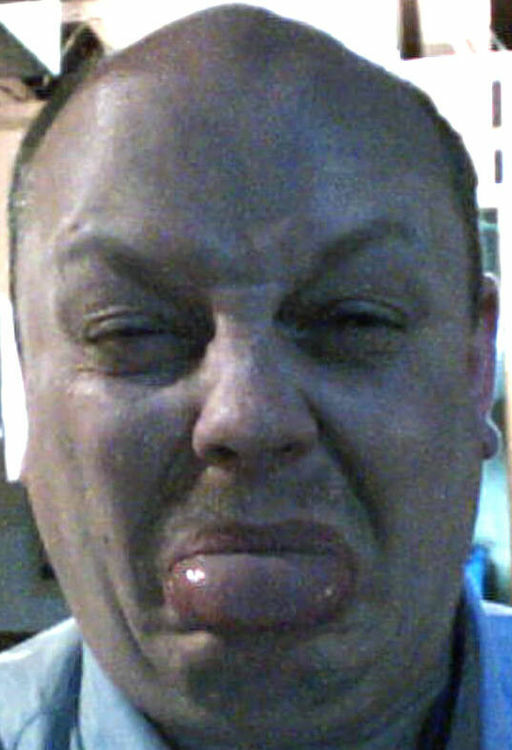 An older study had suggested that the yeast enzyme might be too weak to be useful. This new study finds that this is not the case. The difference between the older study and this one was the purification protocol. The older study purified the native enzyme through multiple chromatography steps while this study used a single affinity chromatography step. The purified yeast and E. coli versions have comparable activity in this study. They are also comparable in terms of being able to work with very low concentrations of Asn. This is important as Asn levels are very low in the blood. What makes the yeast enzyme potentially better is that it is much worse at hydrolyzing a second amino acid, glutamine, than are the bacterial versions. This higher specificity for Asn is important because one of the major side effects of the current treatment is neurotoxicity caused by decreased levels of glutamine in the blood. Since the yeast version hydrolyzes glutamine at a lower rate, they predict patients may not suffer as badly from this side effect with the yeast version. Of course this is all for naught if the yeast enzyme can’t kill cancer cells! Or if it kills cells indiscriminately. The S. cerevisiae version was nearly as good as the E.coli version in tissue culture. After 72 hours of incubation, both versions had little effect on normal cells (HUVEC), and both were cytotoxic to the L-ASNase-sensitive cell line MOLT-4 with the E. coli version killing 95% of MOLT-4 cells and the yeast version killing 85% of them. 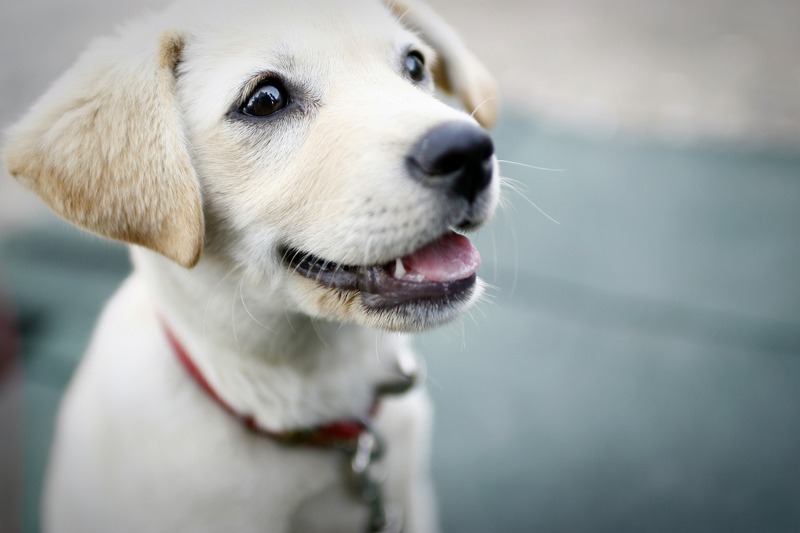 Move over dog, yeast is humanity’s best friend now. Image from pixabay. Taken together these results suggest that the S. cerevisiae version may be an alternative to the bacterial versions. It may be able to kill cancer cells with fewer side effects. But the yeast version is not the only alternative in town. Another group is engineering the E. coli version to lessen its propensity for hydrolyzing glutamine. Either way it looks like certain leukemia patients may be getting an effective cancer treatment with fewer side effects. Beer, wine, bread, chocolate, and now maybe a treatment for a nasty form of leukemia. Yeast may be humanity’s best friend. #APOYG! A Nobel Prize for Work in Yeast. Again! Dr. Yoshinori Ohsumi has won the 2016 Nobel Prize in Physiology or Medicine for his groundbreaking work on autophagy in yeast. Image from freethoughtblogs.com. Dr. Yoshinori Ohsumi has won the 2016 Nobel Prize in Physiology or Medicine for his groundbreaking work on autophagy in yeast. This is the process whereby cells recycle their worn out parts or where a cell, like Mobius, the snake eating its own tail, eats less essential bits of itself to stay alive during times of starvation. Think Scarlett O’Hara using her drapes as a dress in Gone With the Wind (or Carol Burnett’s hilarious parody). Like many, many Nobel Prizes in the past, Ohsumi’s work uncovered basic biological properties using a model organism. In this case he used our favorite lab workhorse, the yeast Saccharomyces cerevisiae, to piece together the steps involved in the recycling of a cell’s own internal structures. And like many other basic biological studies, this one has important medical applications. In this case the two most obvious are chemotherapy resistance and amyloid-β aggregation in Alzheimer’s disease, but it isn’t restricted to just these two. For example, a specialized form of autophagy that targets damaged mitochondria, mitophagy, may not be working well in people with Parkinson’s disease. The key to Ohsumi’s work was finding a way to disrupt this process in yeast so that he could find the important genes underlying autophagy using the awesome power of yeast genetics (#APOYG!). It turns out that this is trickier than it might seem because yeast and their autophagosomes, the little vesicles that surround and encase the bits to be degraded, are very small and so hard to see. In fact, they are so small that there was some question about whether yeast even had this process! If yeast did, then it would take place in the vacuole, the recycling center in yeast. The equivalent organelle in people is the lysosome. To see if autophagy happens in yeast, Ohsumi starved yeast that had vacuoles but couldn’t digest anything. 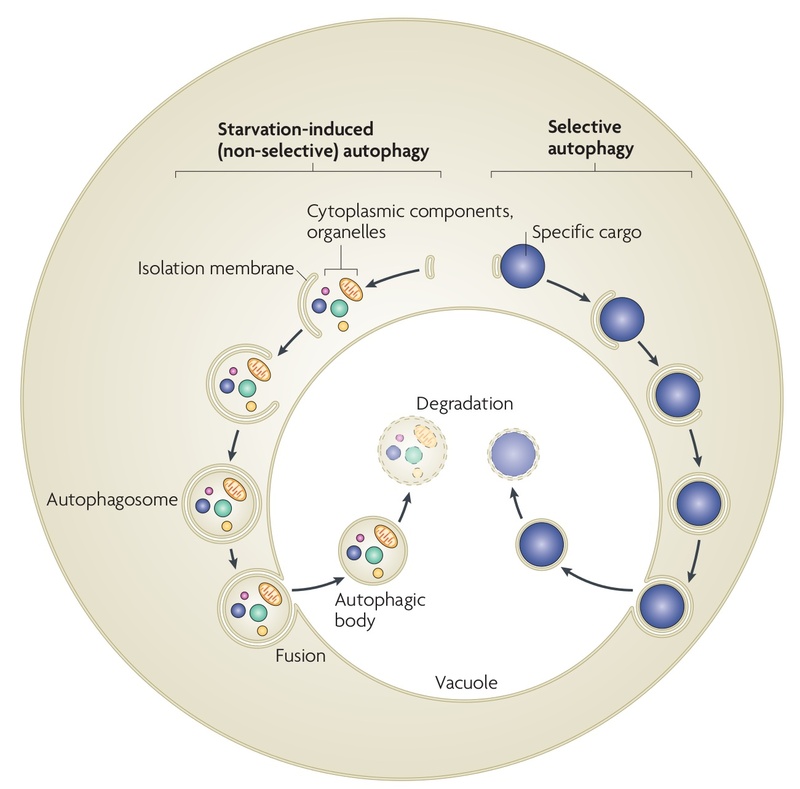 The idea was that there would be a buildup of autophagosomes in the vacuole because the yeast would be desperately trying to eat itself but had no way to digest what it ate. He indeed saw that these poor yeast developed huge vacuoles bloated with autophagosomes. Dr. Yoshinori Ohsumi now had the makings of a yeast screen! “All” he had to do was to look for mutants that didn’t form giant vacuoles under these conditions with the logic being that if you knocked out autophagy, you wouldn’t get a buildup of autophagosomes. The rest, as they say, is history. Ohsumi and his lab managed to tease out the subtleties of this vital cellular process using good old baker’s yeast. What other nuggets of knowledge about ourselves will we pry out of this most useful of eukaryotes? I can’t wait to see what it reveals about us next! Leland H. Hartwell, R. Timothy (Tim) Hunt, and Paul M. Nurse won the 2001 Nobel Prize in Physiology or Medicine for their discoveries of “key regulators of the cell cycle”. Roger D. Kornberg won the 2006 Nobel Prize in Chemistry “for his studies of the molecular basis of eukaryotic transcription”. Elizabeth H. Blackburn, Carol W. Greider, and Jack W. Szostak won the 2009 Nobel Prize in Physiology or Medicine “for the discovery of how chromosomes are protected by telomeres and the enzyme telomerase”. James E. Rothman, Randy W. Schekman, and Thomas C. Südhof won the 2013 Nobel Prize in Physiology or Medicine “for their discoveries of machinery regulating vesicle traffic, a major transport system in our cells”. Bolt’s extra burst of speed helps him win gold medals, but the extra burst given to polymerase by Spt4p is not so helpful – it may contribute to various nucleotide repeat diseases. Image from Getty Images. 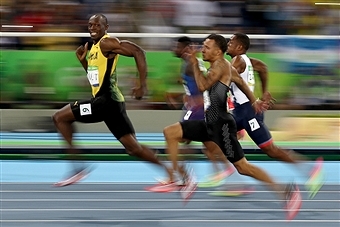 Usain Bolt sprinting is a thing of beauty. It is just amazing how he can kick in the afterburners at the end of a race and just dominate the thing. I am sure Justin Gatlin of the U.S. would love for Bolt to lose this extra burst of speed so Gatlin could beat him at the Olympics. Turns out that transcription elongation has an afterburner a bit like Bolt’s too. It goes by the name SPT4 in yeast and SUPT4H1 in you and me. The protein from this gene is needed to push through long transcripts. A new study in Science by Kramer and coworkers suggests that like Gatlin, some people would like to see their cells lose the burst of speed that SUPT4H1 gives their polymerases. But instead of helping these folks win a race, this loss might help them deal with their amyotrophic lateral sclerosis (ALS) or frontotemporal dementia (FTD). ALS is a progressive neurodegenerative disease that is always fatal. It was first made famous by Lou Gehrig and later with the bucket challenge. After Alzheimer’s, FTD is the second most common form of dementia. Back in 2011 two groups found that a significant number of cases of FTD and ALS were associated with a gene called C9orf72 (chromosome 9 open reading frame 72). These people had hundreds or even thousands of copies of the hexanucleotide repeat GGGGCC in the first intron of their gene instead of the 30 or so that is more typical. Later studies showed that these repeats caused two very specific problems in cells. First, the RNA (and antisense RNA) from this allele tended to build up in small bundles called foci. Some researchers think that these foci trap some of the important RNA binding proteins that the cell needs. The second phenotype is a strange one. These RNAs get translated by a process called repeat-associated non-ATG, or RAN, which causes a buildup of dipeptide repeat proteins. Apparently there is something about the secondary structure of the RNA that allows it to get translated without a typical AUG start codon. The idea is that these foci and weird dipeptide proteins are at least part of the reason why these folks have their ALS symptoms. Ideally you’d want to get at all three issues (the sense and antisense RNA-laden foci, and those newly translated proteins) with a single approach. Kramer and coworkers reasoned that they might get such a result if they could get the cell to make a whole lot less of SUPT4H1 (or Spt4p in yeast). They reasoned correctly. Previous research had shown that its deletion didn’t affect too many genes except for those involved in diseases like Huntington’s – those with long CAG repeats. Perhaps, then, deleting it might also just affect the copies of the C9orf72 gene with those hexanucleotide repeats without affecting too many other genes. When they forced yeast, nematode, fruit fly and human cells to make less Spt4p or SUPT4H1, the number of RNA foci went down or even disappeared in all of these different cells. There was also much less of those dipeptide repeat proteins lurking about the cell as well. They first set out to do some experiments in everyone’s favorite workhorse, Saccharomyces cerevisiae. They found that expressing either the sense or antisense RNA with the 66 hexanucleotide repeats caused both the RNA foci and the dipeptide repeat proteins seen in the cells of ALS patients to form in yeast too. Neither happened with the sense or antisense 2 repeat constructs. Next they showed that deleting SPT4 greatly reduced the level of 66 repeat RNA but had little effect on the 2 repeat RNA. These researchers also saw no RNA foci and much less dipeptide repeat proteins in the deletion strain expressing the 66 hexanucleotide repeats. All without much affecting any other genes. This yeast work suggests that targeting SUPT4H1 might reduce the effects of the ALS version of the C9orf72 gene without affecting the more typical version. Now Kramer and coworkers were ready to see what happens in bigger beasts. When they expressed the 66 repeat in Caenorhabditis elegans neurons, these nematodes lived for a shorter time and their neurons had RNA foci and the dipeptide repeat proteins. Expressing human SUPT4H1 in these worms’ neurons worsened their condition while feeding them RNAi against nematode SPT4 helped. The RNAi let these worms live longer and it decreased the number of RNAi foci and the amount of dipeptide repeat proteins. They saw similar results with a Drosophila system. Finally they moved to the main stage—human cells from ALS patients who had the C9orf72 protein with too many hexanucleotide repeats. RNAi against either SUPT4H1 or its partner in crime, SUPT5H, reduced the number of RNA foci and reduced the amount of dipeptide repeat proteins with no “overt toxicity.” RNA-seq showed that only a small subset of genes was affected with the RNAi treatment. So it looks like targeting SUPT4H1 may be a good strategy for dealing with ALS if the RNA foci and dipeptide repeat proteins are a big part of the problem. This is a big if. 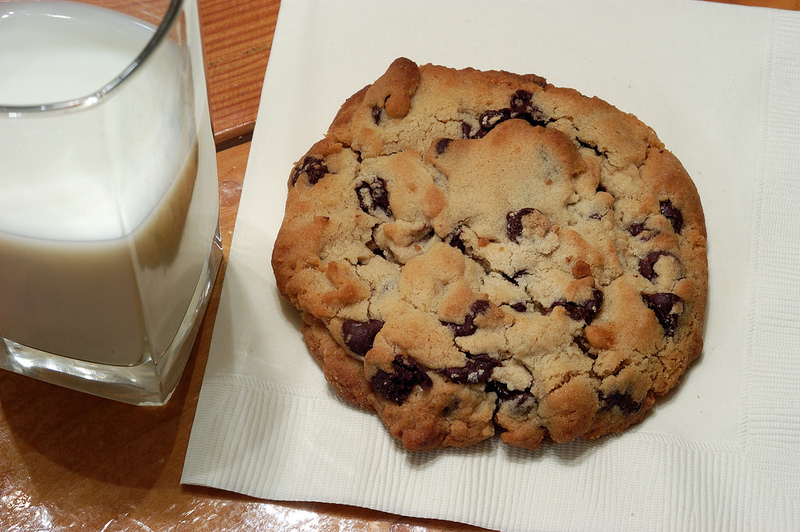 But if it all does work out, we can thank yeast yet again (#APOYG!) for showing us the way to a new treatment for a devastating disease. Of course, though, yeast can’t do everything. It is unlikely to show sprinters the best way to beat Usain Bolt in a race! 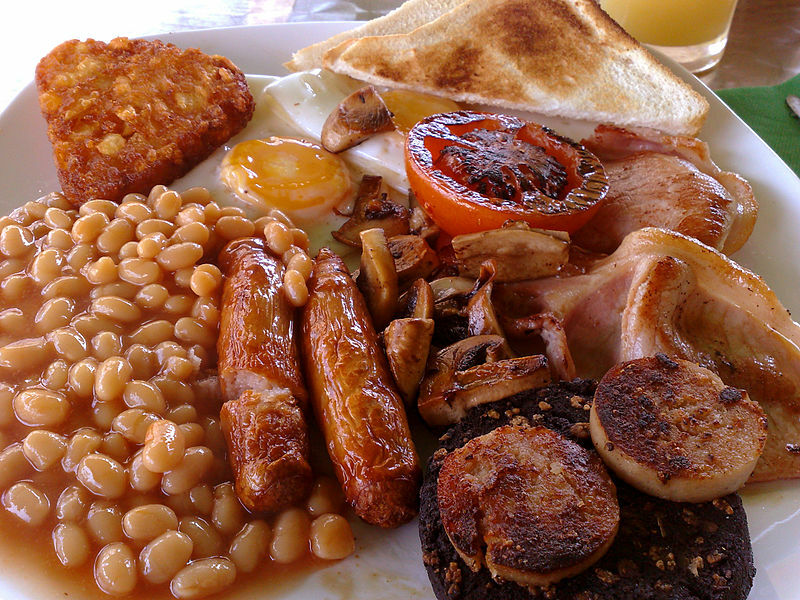 GCN5 for yeast is a bit like a complete English breakfast for people from the US —nonessential. Image from Wikimedia Commons. 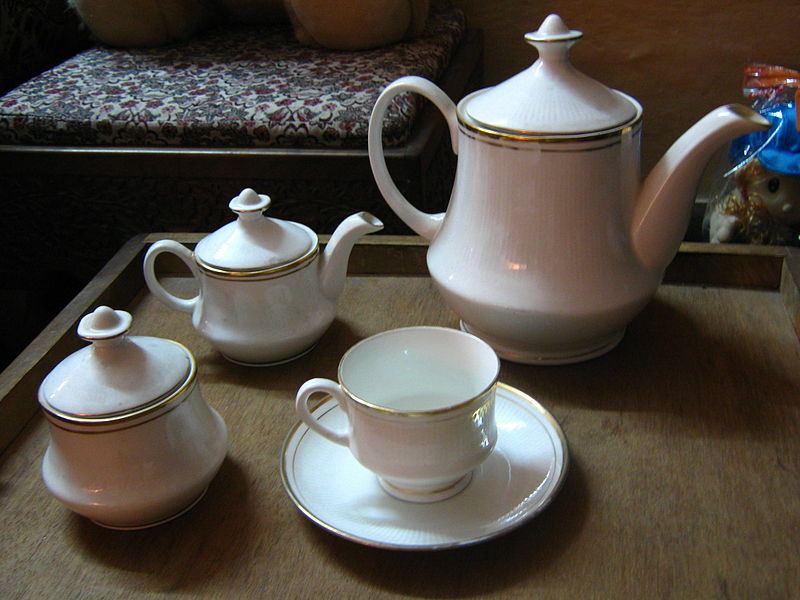 A 2013 poll identified the top 20 modern necessities British people couldn’t live without. Some we can all relate to like smartphones, daily showers, and the internet, while others are more British-specific like a cup of tea or a full English breakfast. It turns out that the GCN5 gene is more like water or air for most eukaryotes—they can’t live without it. But our old friend Saccharomyces cerevisiae is different. This yeast isn’t as happy without GCN5, but it soldiers on nonetheless. This nonessentiality, combined with its powerful genetics, makes yeast a great system for exploring what GCN5 does. And this is just what Petty and coworkers did with this important member of the histone acetyltransferase (HAT) family in a new study in GENETICS. GCN5, like other HATs, transfers an acetyl group to histones, which results in increased activity of nearby genes. Consistent with this, previous work has shown that GCN5 acetylates histone H3 in the promoters of active genes. HATs, along with their countervailing proteins histone deacetylases, as well as kinases, phosphatases, methyltransferases and so on, all work together to change gene expression on the fly in response to all sorts of different stimuli. These can include environmental signals, entering the cell cycle, or whatever. Understanding how HATs work is critical for understanding how we (and other beasts) change gene expression in response to these signals. Which is what makes GCN5 in yeast such a great system. A strain deleted for GCN5 is sick, but alive, so we can study what happens when it is gone. And we can explore what we can do to fix its problems. One of the many problems that yeast lacking GCN5 have is that they grow more poorly at high temperature than do yeast with GCN5. These researchers took advantage of this and looked for high copy suppressors of this temperature sensitivity. They found multiple genes, but the most common was RTS1, one of two regulatory subunits of the PP2A phosphatase complex. Deleting GCN5 causes more problems than temperature-sensitivity, and overexpressing RTS1 restored some, but not all, of them. For example, RTS1 overexpression helped make the Δgcn5 strain less sensitive to DNA damage, less susceptible to microtubule disruption, better able to grow on nonfermentable carbon sources like glycerol or ethanol, and more able to progress into S phase during mitosis. But lots of PP2ARts1 could not rescue the abnormal buds nor the sporulation problems seen in a diploid lacking GCN5. When the researchers deleted RTS1 or some of the genes that code for other critical components of the PP2ARts1 complex in a Δgcn5 strain, the strain died. The same was not true of a second regulatory subunit that can be part of the PP2A complex, CDC55—its deletion was not lethal, nor did it rescue the temperature sensitivity of the Δgcn5 strain. Petty and coworkers provided evidence that the phosphatase activity of the PP2ARts1 complex was important by showing that okadaic acid, an inhibitor of this family of phosphatases, prevented Rts1p from rescuing the Δgcn5 strain’s temperature sensitivity. The easiest explanation is that the rescue happens because of the phosphatase activity of PP2ARts1, but it is also possible that a different member of the family might be providing the phosphatase activity. So it looks like there is something important happening between PP2A and GCN5. Petty and coworkers next set out to find out what that might be. First they showed that deleting GCN5 causes a decrease in the levels of core histones in the cell and that RTS1 overexpression fixed this problem. This happened at the transcription level as the RNA levels of the yeast histone genes (with the exception of HTA1) all showed reduced expression in the absence of GCN5, which again was restored when RTS1 was overexpressed. Histone genes are normally turned on at the end of G1, then shut off at the end of S phase. This makes sense, as a cell needs to make more histones when it makes a new copy of its genome and this happens during S phase! What might be essential in one setting is not necessarily so in another. Image from Wikimedia Commons. Consistent with the reduced histone gene expression seen earlier, the Δgcn5 strain failed to increase histone gene activity at the end of G1. Overexpressing RTS1 restored this induction. So it looks like GCN5 is involved in turning on all the histone genes, except maybe HTA1, at the right time, and that RTS1 can compensate if there is a lot of it around. As a final set of experiments, the authors looked at what PP2ARts1 might be doing to rescue histone gene expression when GCN5 was deleted. They decided to look at histone modifications. For this they used the SHIMA (Scanning HIstone Mutagenesis with Alanine) library, in which all key serine and threonine residues were individually mutagenized to alanine. Even though PP2ARts1 is thought to be primarily a serine/threonine phosphatase, they also looked at three tyrosine residues (Y40, Y43, and Y45) on H2B by mutating each individually to phenylalanine. 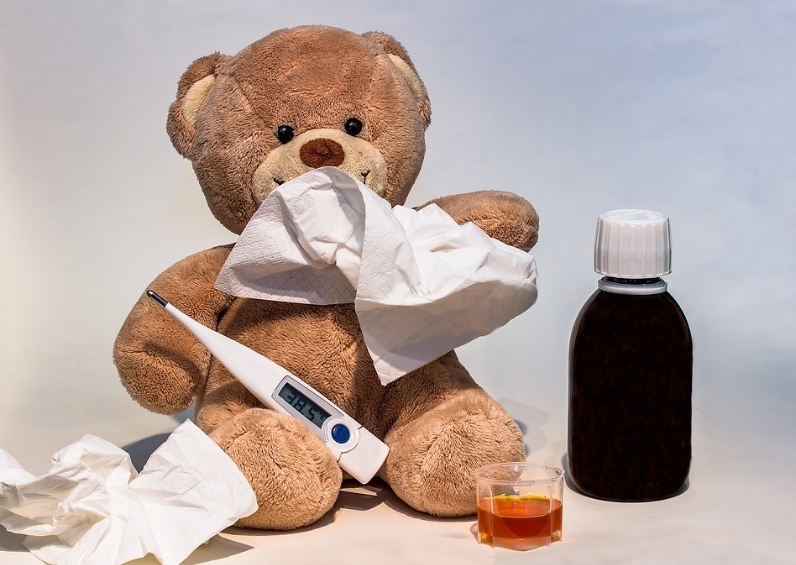 They found that two residues on histone H2B, Y40 and T91, were required for RTS1 to be able to rescue the temperature sensitivity of a Δgcn5 strain. And mimicking the permanent phosphorylation of T91, by mutating it to either aspartic or glutamic acid, slowed the growth of wild type yeast and killed the deletion strain. This tells us a lot about what GCN5 is doing in yeast, and it might also help us better understand certain human cancers. Turns out that the residue equivalent to T91 in mammals is phosphorylated in these cancers. Petty and coworkers were able to learn all of this because of yeast’s powerful genetic tools, and because GCN5 is not essential in yeast. Once again, the awesome power of yeast genetics (#APOYG!) can help us understand human cell biology. Like Tony Curtis and Jack Lemmon in “Some Like it Hot”, some transcription factors take on dual roles. Image from Wikimedia Commons. 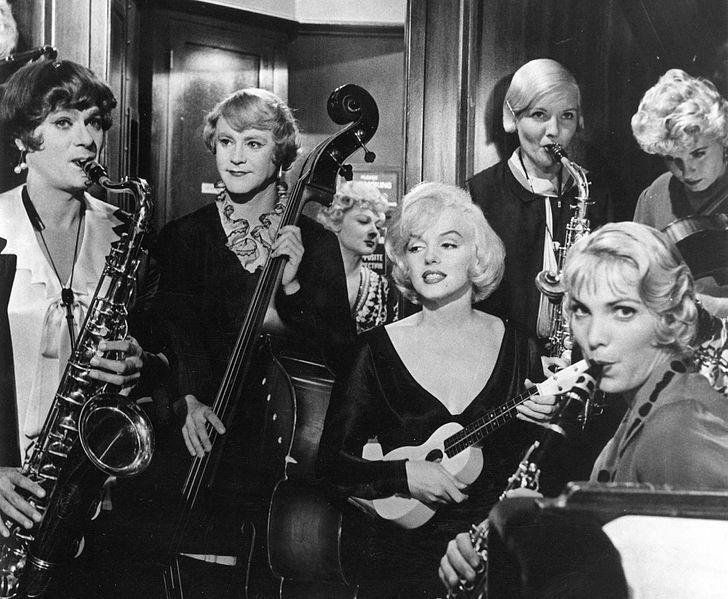 According to an AFI poll, the best comedy of all time was the 1959 film “Some Like It Hot.” In this classic screwball comedy two men have to dress up as women to escape the mob and still make money as musicians. All sorts of hilarity ensues as one of them falls in love with a woman and a man falls in love with the other as a woman. The key to this comedy is that the two actors, Tony Curtis and Jack Lemmon, have to play both the male and female parts. If they were played by separate actors and actresses, the movie would die at the box office. It would be a lethal mutation. A new study by Solis and coworkers in Molecular Cell presents evidence that in yeast, the heat shock transcription factor Hsf1p is a bit like Tony Curtis and Jack Lemmon—it plays dual roles, both in maintaining basal levels of various heat shock proteins and in turning the appropriate genes up in response to a heat shock. This is different than in mammalian cells where HSF1 is only responsible for turning up heat shock genes in response to a spike in temperature. Something else maintains the levels of these proteins needed for survival. So yeast is more like the comedy “Some Like it Hot,” or perhaps Tootsie, while mammalian cells are more conventional comedies where different actors play the male and female roles. Because Hsf1p plays a dual role in yeast, its deletion causes the cell to die. Mammalian cells can survive without HSF1 as long as it doesn’t encounter any temperature spikes. Solis and coworkers started out by coming up with a way to dissociate the genes that Hsf1 regulates under normal conditions from those upregulated under heat shock conditions. For this they used the “Anchor-Away” approach to remove Hsf1p from the nucleus under normal conditions. Basically, they co-expressed HSF1 fused to FRB, the FKBP rapamycin-binding domain, and a ribosomal protein L13A-FKBP12 fusion. When they add rapamycin to this strain, the two proteins heterodimerize and Hsf1p is dragged out of the nucleus. They confirmed that Hsf1p was gone from the nucleus within a few minutes. Next, they used native elongating transcript sequencing (NET-seq) 15, 30, and 60 minutes after rapamycin addition to see which genes were affected when Hsf1p left the nucleus. They found that only 25 genes were repressed and five were induced at these time points. Using RNA-seq and ChIP of Hsf1p they showed that Hsf1p was probably responsible for the expression of 18 of the 25 repressed genes and none of the induced ones. So yeast Hsf1p is involved in the basal expression of a number of chaperone genes. In a set of experiments that I don’t have time to go over here, they also showed that most of the heat shock response was independent of Hsf1p in yeast. Their data suggests that Msn2/4p may be the key player instead. They next did a similar set of experiments in mammalian cells but with a couple of differences. First off, these cells can survive HSF1 deletion, meaning they didn’t need to do anything fancy—they just used CRISPR/Cas9 to delete the gene in mouse embryonic stem cells and mouse embryonic fibroblasts. Under normal conditions they found that the deletion of this gene caused two genes to go up in expression and two to go down. This is what you might expect by chance suggesting that in mammalian cells, HSF1 isn’t involved in basal expression of any genes. They next used RNA-seq to compare gene expression of these cells and their undeleted counterparts under normal and heat shock conditions. They found a set of nine genes that were induced in both wild type cells and repressed in the HSF1-deleted cells under heat shock conditions. Eight out of nine of these are involved in chaperone pathways and they overlap surprisingly well with the yeast genes that Hsf1p controls under basal conditions. Taken together these experiments paint an interesting picture. In yeast, HSF1 is mostly responsible for the basal expression of chaperone genes, and in mouse cells it is a key player in the heat shock response of a similar set of genes. This suggests that deletion of HSF1 is lethal in yeast because the decreased expression of one or more of the genes it regulates under normal conditions. 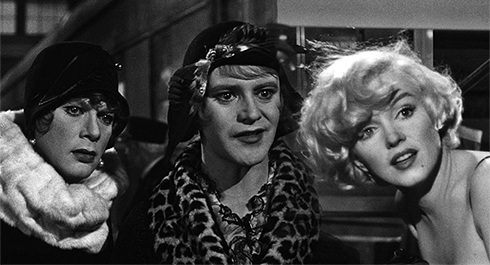 In cancer cells, HSF1 takes on dual roles, like both Curtis and Lemmon in “Some Like it Hot”. Image from cinema-stache.com. They tested this by expressing 15 of the 18 genes (three are redundant to some of the others) on four different plasmids and saw that a yeast strain that is deleted for HSF1 now survives. So one or more of these genes is responsible for yeast death in the absence of HSF1. Through a process of elimination, Solis and coworkers found that the key genes were SSA2, a member of the HSP70 family, and HSC82, an HSP90 family member. The decrease in expression of these two genes cause by the deletion of HSF1 results in a dead yeast cell. These experiments are so cool. In yeast, HSF1 makes sure there is enough of these chaperones around in good times to fold proteins properly and has a minor role in the heat shock response, while in mouse cells, the same gene plays no real role in basal levels of expression of chaperone genes and instead is critical for responding to heat shock. The protein regulates similar genes, just under different conditions. These neat science experiments can tell us more about diseases, like cancer too. Turns out that some cancer cells may be more like yeast cells in that deletion of HSF1 stops them from growing and causes an increase in poisonous protein aggregates which may give us a new way to target HSF1-dependent cancers. For example, it may be that targeting Hsp70 or Hsp90 could be useful for treating HSF1-dependent cancers. In cancer cells then, HSF1, like Dustin Hoffman in Tootsie, Milton Berle in the Milton Berle Show, or Bugs Bunny in many different cartoon shorts, takes on dual roles in the cell. And as we learned from yeast, this could be these cancers’ Achilles heel. 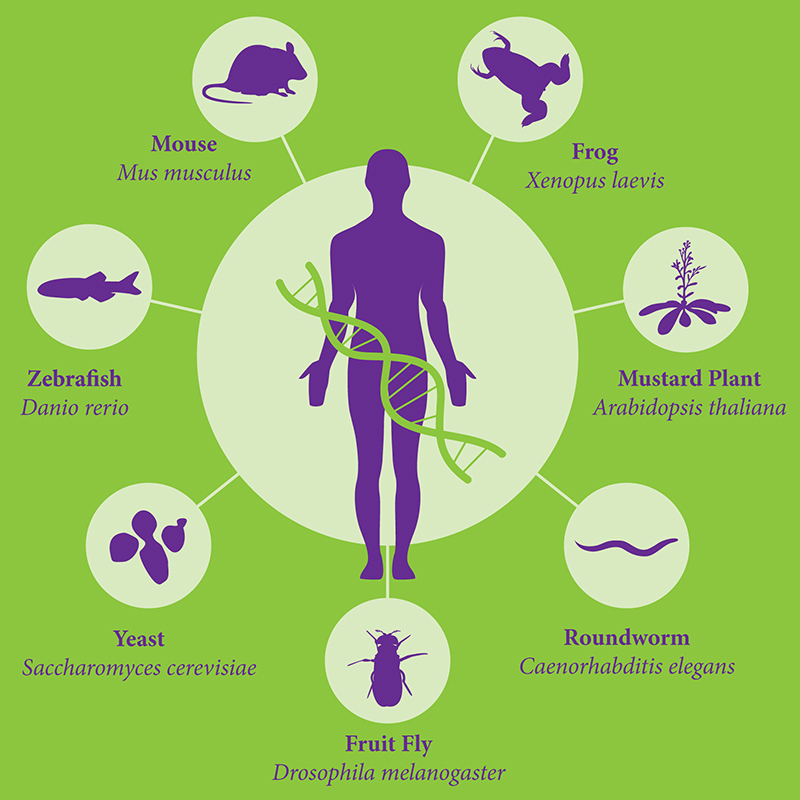 Model Organisms such as yeast, worm, fly, fish, and mouse are key drivers of biological research, providing experimental systems that yield insights into human biology and health. Model Organism Databases (MODs) enable researchers all over the world to uncover basic, conserved biological mechanisms relevant to new medical therapies. These discoveries have been recognized by many Nobel Prizes over the last decades. NHGRI/NIH has recently advanced a plan in which the MODs will be integrated into a single combined database, along with a 30% reduction in funding for each MOD (see also these Nature and Science news stories). While integration presents advantages, the funding cut will cripple core functions such as high quality literature curation and genome annotation, degrading the utility of the MODs. Leaders of several Model Organism communities, working with the Genetics Society of America (GSA), have come together to write a Statement of Support for the MODs, and to urge the NIH to revise its proposal. We ask all scientists who value the community-specific nature of the MODs to sign this ‘open letter’. The letter, along with all signatures, will be presented to NIH Director Francis Collins at a GSA-organized meeting on July 14, 2016 during The Allied Genetics Conference in Orlando. 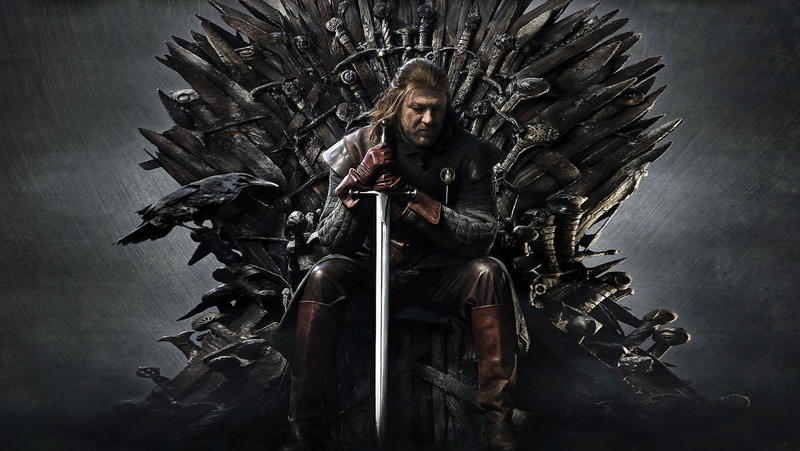 We urge you to add your name, and to spread the word to all researchers who value the MODs. In other words, sign this letter!